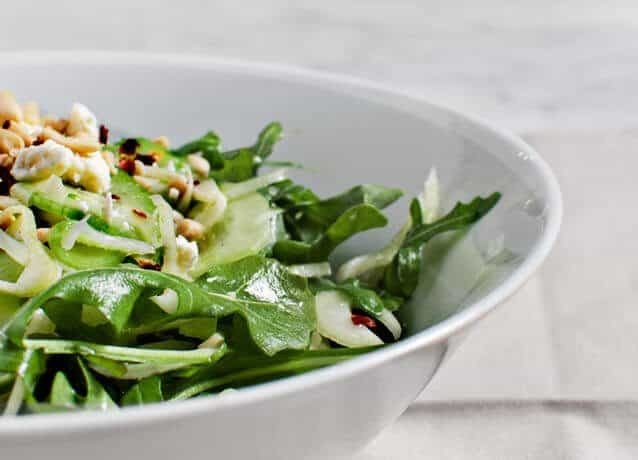 A simple and flavorful 30-minute spring salad with tossed arugula, lemon-marinated fennel & cucumber, basil, feta, and pine nuts. Vegetarian & gluten free. We’ve eaten this at least once a week for the past few months. 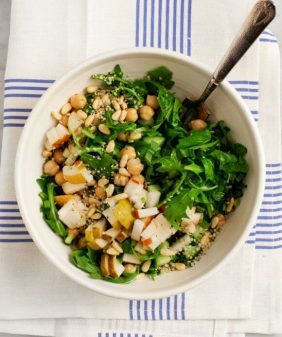 Serve it side-by-side with a bowl of soup or make it a meal by adding grilled scallops, shrimp, or tofu. 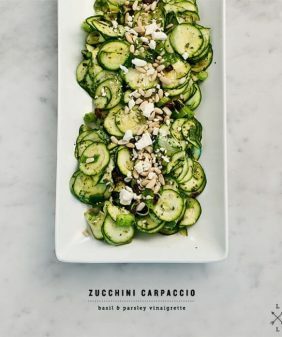 Thin slices of marinated fennel and cucumbers create a tangy bite which nicely balances the light, spicy arugula. 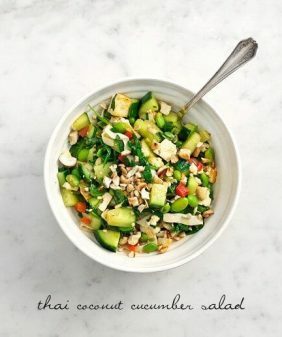 Toss the shaved fennel and cucumber with with the lemon, olive oil, agave nectar (if using), and a pinch of salt and refrigerate for 15-20 minutes. Meanwhile, toast and chop the pine nuts. 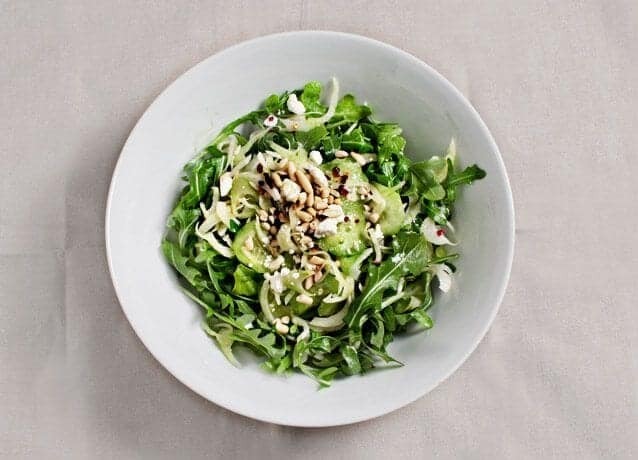 Put the arugula in a large bowl and toss with the marinated fennel & cucumbers, pouring most of the lemon dressing on top. Taste and adjust salt, olive oil, lemon juice, and agave to your liking. 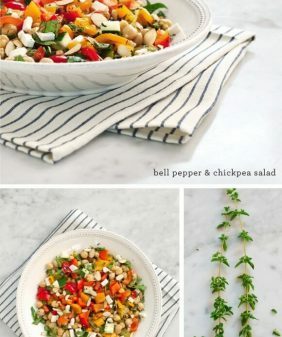 Top with the toasted pine nuts, basil, and feta. A pinch of red pepper flakes is a nice touch here, too. 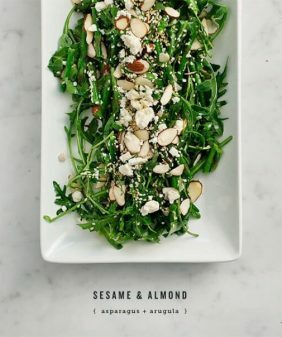 arugula has a really interesting flavor, but the whole combination of the salad seems to work pretty good! I paired your salad with Martha Stewart’s Beer Can Chicken with Fig Pan Sauce. It was the perfect complement to the richness of the chicken. 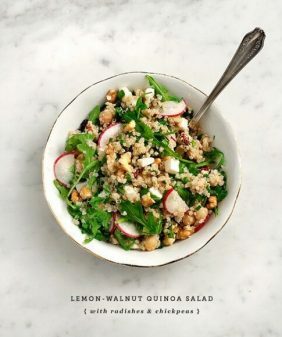 I stumbled across your recipe after I saw that fennel and arugula were good paired with fig. Thanks so much! We will be making this again and again.